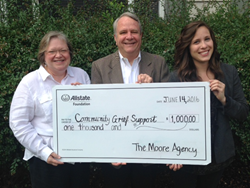 The Moore Agency, a central Alabama insurance and financial planning firm with offices serving Birmingham and the surrounding areas, is joining Community Grief Support Services in a charity drive aimed to providing assistance to nearby residents overcoming tragic loss. With more than 11,000 funerals affecting families in the Birmingham area annually, Community Grief Support Services (CGS) works to offer counseling and bereavement services to families struggling to overcome the loss of a loved one. Over 2,500 Alabamans benefit from CGS services each year, and the organization also works to offer grief education and awareness workshops to the local population. “Helping families move forward after loss is difficult, which is why we’re proud to work with CGS and provide meaningful assistance to the families here in Birmingham that need it,” says Jimmy Moore, founder and manager of the Moore Agency. To date, over $1,000 has been raised for CGS, with more supporters joining the ranks each week. The CGS charity drive is being publicized over a social media portal produced by the Moore team, as well as via an email update system that keeps nearby community leaders informed. The Moore Agency will also be creating an article featuring the CGS charity event in this month’s issue of “Our Hometown,” a monthly webzine published by the Moore Agency: http://www.themooreagencies.com/Our-Hometown-Magazine_41. Several other Birmingham-area charities and organizations have benefitted from the help of the Moore Agency over recent months. As part of a permanent community involvement program called “Agents of Change,” the firm will be selecting and supporting a new Alabama non-profit every other month. For those who wish to join the Moore Agency team and take part in the CGS charity event, the following information page has been made available: http://www.themooreagencies.com/Community-Grief-Support-helps-those-grieving-the-loss-of-a-loved-one_45_community_cause. For those interested in more information on charities and causes already supported by the Moore Agency team, the firm’s Community Causes listing can be found here: http://www.themooreagencies.com/community-cause. As a Personal Finance Representative in Homewood, agency owner Jimmy Moore has established lasting relationships with many local families. A knowledge and understanding of the people in the Homewood community allow the Moore team to provide customers with an outstanding level of service. Jimmy and his team look forward to helping families just like yours protect the things that are important - family, home, car and more. The Moore agency also helps clients prepare real world strategies to achieve financial goals. To contact an expert at the Moore Agency, visit http://www.themooreagencies.com/ or call (205) 983-6175.